(When) the United States was a mobile society and people were spreading everywhere, Thanksgiving was when people wished to reconstitute their families. (The) reason Thanksgiving celebrations have changed may be that families have changed and nonrelatives have come to take on family-like roles in people’s lives. 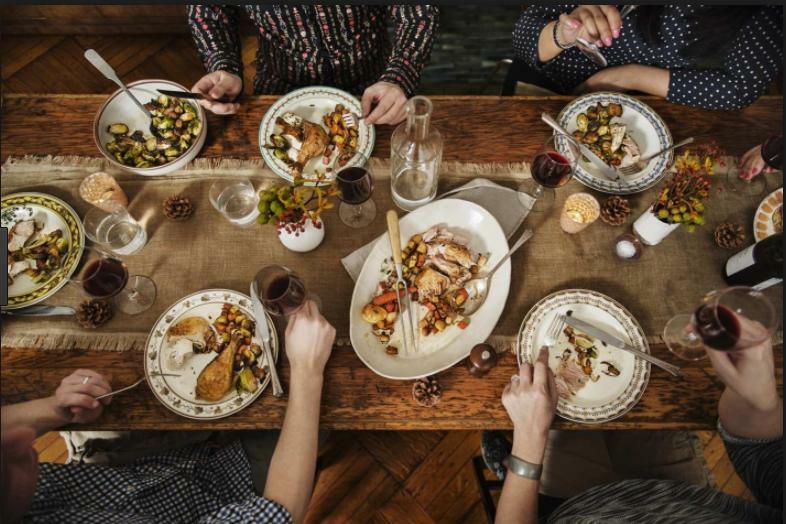 Friendsgiving (has) evolved from an ad hoc Thanksgiving replacement when people found themselves far away from family on the holiday to an in-addition-to-Thanksgiving event. Thanksgiving has hung on to its original ideals: hospitality, generosity, inclusion. Every year for the past five or so, the Emily Post Institute—long considered the leading authority on matters of manners and courtesy—fields at least one or two etiquette questions about “Friendsgiving.” Usually they come from people in their 20s and 30s, says Lizzie Post, the co-president of the institute and the eponymous etiquette authority’s great-great-granddaughter. The advice seekers are often anxious about exactly how to host a Friendsgiving party, a Thanksgiving-themed meal for their close friends. The Google Trends graph of the word Friendsgiving—indicating how often people have Googled the term over the past nearly six years—looks like a row of increasingly menacing icicles flipped upside down: From 2004 to 2012, virtually nobody was scouring the internet for the term, but a tiny nub of search interest in November 2013 gave way to a small spike in November 2014, followed by exponentially intensifying spikes the next three Novembers. Food publications such as Chowhound and Taste of Home have recently released Friendsgiving host guides; almost 960,000 posts pop up when you search Instagram for the hashtag #friendsgiving. At press time, some 3,000 of those had been added in the past 24 hours. Post and others I spoke to for this story agree that Friendsgiving seems to have evolved in recent years from a sort of ad hoc Thanksgiving replacement (implemented when people found themselves far away from family on the holiday but near friends) to a common in-addition-to-Thanksgiving event, one that’s exclusively for friends. In other words, Friendsgiving has become a widely celebrated American holiday in its own right—and while it’s hard to know in real time what cultural shifts or forces have led to the rise of Friendsgiving, there are a few compelling theories as to why you may be seeing the term pop up again and again in Venmo transactions this week. It is, of course, distinctly possible that the surging popularity of Friendsgiving is directly tied to the power of portmanteaus. Slapping a catchy name onto an existing concept can, after all, make it seem trendy or suddenly ubiquitous, even if the thing itself has been around for decades (see: bromance or jorts). But one way to understand Friendsgiving’s recent popularity is as the expansion of the Thanksgiving holiday into something more like a Thanksgiving season. As Matthew Dennis, a University of Oregon professor emeritus who’s studied the nearly 400-year history of Thanksgiving, points out, holiday celebrations are always evolving. For example, “Halloween has really transformed a lot in the last generation or two. It’s completely different from what it used to be,” he says. Ever since the late 1980s or 1990s, “it’s almost as much an adult holiday as it is a kids’ holiday.” Plus, it’s not unheard of for certain holiday celebrations to sprawl into the surrounding days and weeks: Lots of friend groups have Christmas or winter holiday parties in the lead-up to whatever they might have planned with their families on the actual holidays. So do offices—which have also lately become common sites for Friendsgivings. So another reason Thanksgiving celebrations have changed may be that families themselves have changed—and nonrelatives have become more likely to take on family-like roles in people’s lives. Given what we know about the Millennial generation’s habit of delaying marriage and parenthood into later stages of life compared with prior generations, it makes sense to Dennis that, especially for those who remain unmarried and/or childless well into their adult years, the most important people in their lives might be friends. It’s also possible, he notes, that young adults with the space and equipment to host a dinner party might find themselves eager to host a grown-up Thanksgiving meal but not in a position within their own families to host the “official” event. Now that all her friends are adults and have moved to different places for work and school, “we’re not always able to see each other. Even if I see my best friend one weekend, I’m not able to see everyone together,” Myers says. “So Friendsgiving is when everybody’s like, ‘Okay, we’re all gonna be here this weekend to see each other.’ If you miss somebody and you want to see them and catch up, that’s the time.” This year—she checks her group text thread to get the exact head count—14 people will be in attendance. The institution of Friendsgiving may, to some, feel like Thanksgiving overkill. But Dennis, the Oregon professor emeritus, who was unfamiliar with the growing Friendsgiving tradition until I interviewed him for this story, finds a pre-Thanksgiving Friendsgiving to be a perfectly acceptable extension of the holiday. “In some ways, the thing that’s distinctive about Thanksgiving is that it’s not Christmas. It’s not about gift-giving, it’s not about spending a lot of money. A lot of it should be homemade and improvisational. Whereas Christmas is, well, you know, this bonanza of commerce,” he says. Thanksgiving has managed to hang on to its original ideals: hospitality, generosity, inclusion. What’s more inclusive than expanding the holiday to include friends as well as family?